Authorized by Congress in 1931, the Philadelphia Naval Hospital was the first high-rise hospital building created by the United States Navy. Opened during the inter-war period, the hospital was state-of–the-art and its facilities included nurses’ lodging, corpsmen’s quarters, four officers’ quarters, a garage, a film-storage building, and a greenhouse. The Art Deco main building, designed by the Karcher and Smith firm, symbolized a jump into the modern era and was regarded as one of the finest Art Deco buildings in the city. However, by the 1980s the building was declining in use and beyond renovations. It was vacant from 1993 until its demolition in 2001. This 1966 photograph showcases Philadelphia’s Naval Shipyard from six thousand feet in the air. The shipyard was constructed in 1871 on League Island, an island in the Delaware River near the mouth of the Schuylkill River. During WWII the shipyard functioned at peak production and built over fifty ships, including the famed battleships New Jersey and Wisconsin. 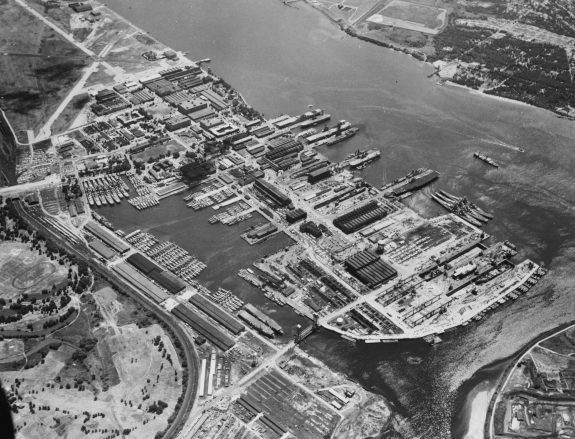 Following the war, League Island was connected to Philadelphia’s mainland, but the shipyard’s output slowly declined and its last ship was built in 1970. The shipyard fully closed in 1995 after decades of reduced activities and decreased demand. In 2000, the City of Philadelphia purchased the site and rebranded the area as “The Navy Yard,” a mixed-use business campus intended to attract corporate offices and headquarters. As of 2016, Urban Outfitters, Tasty Baking Company, and a growing list of other businesses called the Navy Yard home. Bertha Stallworth is shown inspecting an artillery cartridge in this 1943 photograph from the Frankford Arsenal. Constructed in 1816, the Northeast Philadelphia building employed one thousand men during the Civil War, six thousand at the height of WWI in 1918, and a record twenty-two thousand during WWII. 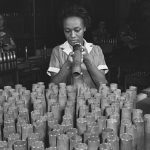 In the 1940s, Stallworth and many other young women took jobs in factories and arsenals while men their age fought overseas. Access to well-paid jobs outside the home is often cited as one of the catalysts of the women’s liberation movements during the mid and late twentieth century. The Frankford Arsenal suffered problems similar to those of the Naval Shipyard and was closed in 1977. As of 2016, part of the arsenal had been rehabilitated into office spaces. Staff Sgt. 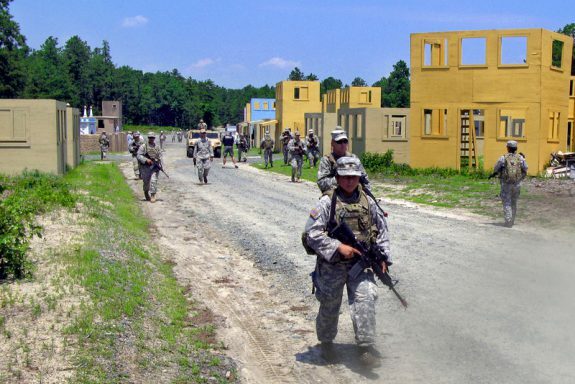 Nancy Gonzalez, an Army reservist with the 425th Civil Affairs Battalion from Encino, California, leads her civil affairs team from a mock Afghan village on July 7, 2011, at Joint Base McGuire-Dix-Lakehurst during training before deploying to Afghanistan. The training area in the Pine Barrens of New Jersey has a long history as a military base. World War I led the military to establish Camp Dix near Wrightstown, a site that was close to major ports of embarkation (including Philadelphia, thirty-two miles away) and supply routes, including the Pennsylvania Railroad. Opened in June 1917, the camp was named for Major General John Adams Dix (1798-1879), a veteran of the War of 1812 and the Civil War who also served as a U.S. senator, secretary of treasury, and governor of New York. In 1941, the U.S. government took over the Municipal Airport in Dover, Delaware, converting it to a U.S. Army Air Corps airfield. Today, Dover Air Force Base is the location of the Air Force Mortuary Affairs Operation Center. In this photograph from July 8, 2009, the chairman of the Joint Chiefs of Staff, Admiral Michael Mullen, and other officials salute the coffin of a fallen service member during a transfer from a transport plane at the base. 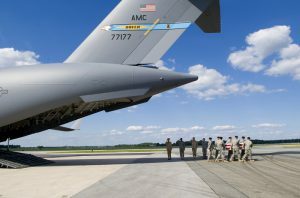 All fallen service members are transferred directly from theater to the Air Force Mortuary Affairs Operation Center at Dover Air Force Base Delaware. For centuries, the American military valued Philadelphia because of its size, manufacturing capability, and location. Bases and other military facilities in the region contributed to the United States’ national defense while also serving as economic engines for surrounding areas, creating jobs not just on the installations but also in surrounding communities. Closures, conversely, led to job losses, unless redevelopment filled the void. American military facilities in the region date to the era of the Revolution. Despite Pennsylvania’s origins as a Quaker colony, defenses became necessary as confrontation with the British became increasingly likely. Products of this effort included Fort Mifflin on Mud Island near the junction of the Delaware and Schuylkill Rivers and Fort Mercer, New Jersey, on the eastern bank of the Delaware River across from Fort Mifflin. Unlike more-modern military bases in the continental U.S., built primarily for staging or training of troops, research and development, or other maintenance, readiness and support functions, the government constructed Forts Mifflin and Mercer to physically impede enemy advancements. After the Revolution, the new nation sought to establish itself as a military force. Toward that end, the government began construction of the Schuylkill Arsenal in Philadelphia in 1800, assumed control of a shipyard in the Southwark district south of the city proper in 1801 (the first Philadelphia Navy Yard), and established the Frankford Arsenal in northeast Philadelphia in 1816. These facilities proved critical to national defense and the local economy. Although it is difficult to quantify the exact number of employees at a military facility at any given time, during the Civil War, the Naval shipyard employed at least three thousand men whose work included producing eleven warships. The Frankford Arsenal employed about one thousand and churned out munitions, while the Schuylkill Arsenal, as the Union Army’s primary depot for clothing, put thousands of seamstresses to work making uniforms. Philadelphia also hosted two of the largest military hospitals in the United States in the Civil War era: Satterlee Hospital in West Philadelphia and Mower Hospital in Chestnut Hill. These institutions closed with the war’s end, but the arsenals and the shipyard survived (if with reduced workloads). In 1867, Congress passed legislation to enlarge and relocate the shipyard to the southern tip of Philadelphia, surrounded on three sides by the Schuylkill and Delaware Rivers. It ultimately encompassed approximately twelve hundred acres. During World War I, employment at the shipyard soared to around twelve thousand. The Schuylkill Arsenal employed close to ten thousand civilians at the peak of its operations in 1918, while the Frankford Arsenal employed just over six thousand that same year. 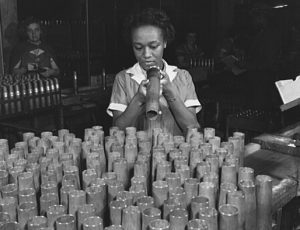 Women comprised a significant portion of these employees, as they did in factories across the country during this conflict and WWII. 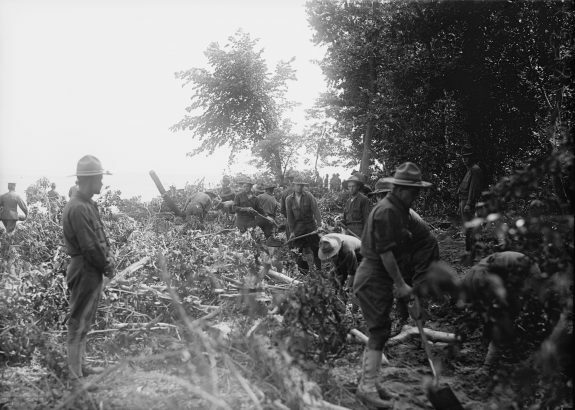 WWI also led the military to establish Camp Dix near Wrightstown, New Jersey, a site that offered proximity to major ports of embarkation (including Philadelphia, thirty-two miles away) and supply routes, including the Pennsylvania railroad. Opened in June 1917, the camp was named for Major General John Adams Dix (1798-1879), a veteran of the War of 1812 and the Civil War who also served as a U.S. senator, secretary of treasury, and governor of New York. 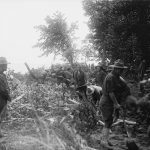 During the war, Camp Dix trained and staged the 78th, 87th, and 34th Divisions, and following the armistice, it became a demobilization center. The interwar period saw employment at sites like the arsenals and the shipyard fall off dramatically. The Schuylkill Arsenal survived, though it was renamed the Philadelphia Quartermaster Depot and moved from its original site at Grays Ferry Avenue and Washington Avenue to West Oregon Avenue and Twenty-Second Street. 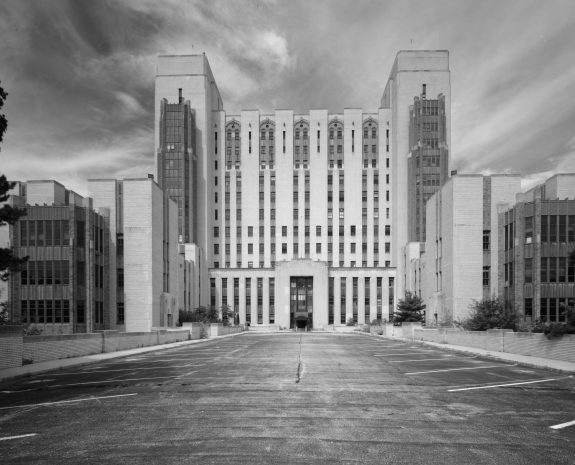 Growth also occurred, however, as Congress in 1931 authorized construction of the Philadelphia Naval Hospital, a project completed in part with funds from the Public Works Administration. The hospital complex, on a twenty-two-acre tract north of League Island Park and the Philadelphia Navy Yard, included an impressive Art Deco main hospital building for 650 patients and associated facilities such as a nurses’ home, corpsmen’s quarters, four officers’ quarters, a garage, a film-storage building, and a greenhouse. 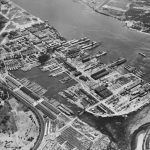 During the World War II era, new military installations opened and existing sites expanded, easing the deprivations of the Great Depression for the population of Philadelphia and the surrounding region. The workforce of the Philadelphia Naval Shipyard, for example, climbed to forty-seven thousand, by one count. Coastal defense fortification Fort Miles, with its sixteen-inch guns and 90mm anti-aircraft batteries, began operations in 1941 in Delaware to protect Philadelphia and its environs. 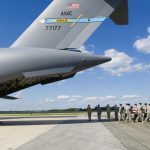 That same year, the military opened Fort Dix Army Air Force Base in New Jersey and took over the Municipal Airport in Dover, Delaware, converting it to a U.S. Army Air Corps airfield. In 1942, the United States Navy purchased land in Horsham, Pennsylvania (north of Philadelphia in Montgomery County), for the U.S. Naval Air Station Willow Grove. These acquisitions indicated the increased importance of aerial warfare during the period. When the American military demobilized following World War II, the numbers employed by military bases in the Philadelphia region decreased correspondingly, as they had following WWI. A few bases closed, while others gained new purposes for the emerging Cold War era. Fort Miles, for example, closed as advancements in aerial warfare rendered its coastal artillery obsolete. On the other hand, the Fort Dix Army Air Force Base, though mothballed briefly, reopened in 1948 as McGuire Air Force Base. The name memorialized Medal of Honor Recipient Major Thomas B. McGuire Jr. (1920-45), who died in action during World War II. Naval Air Station Willow Grove became a Naval Air Reserve Training Station, and in 1957 the Department of Defense purchased additional land, bringing the air station to a total of 1,100 acres. The Philadelphia Naval Hospital saw growth in the decades following WWII as well. By the Vietnam War era, it could accommodate up to 1,100 patients. In later years, the hospital became a renowned training and research facility. During the United States’ protracted involvement in Southeast Asia, Philadelphia and its environs did not see the level of wartime mobilization that had produced benefits during earlier conflicts. The shipyard, for example, gradually outsourced new construction and focused on repairs and maintenance. The last ship it constructed was the USS Blue Ridge, commissioned in 1970. This privatization of much of the shipyard’s mission reflected the changing nature of war. The Vietnam War was not a war on the scale of a total war in the way that World War I and World War II were, nor was it comparable in the numbers of troops mustered (and needing to be trained, outfitted, and resupplied). As the Vietnam War wound down, the American military continued to curb spending and divest itself of property and missions that could be streamlined or outsourced to private industry (rather than just reducing the numbers employed at existing sites). This mindset contributed to the 1976 decision to close the Frankford Arsenal, which had opened in 1816 and still employed about two thousand people at the time of its closing in 1977. As the Cold War diminished, additional Philadelphia area facilities severely curtailed operations or closed following recommendations by the federal Base Realignment and Closure (BRAC) Commission, a board of civilian appointees created by Congress in 1988 to excess military property, subject to approval by Congress and the president. The BRAC Commission was intended to ensure, among other things, that bases were not shuttered for purely political reasons (although congressional districts impacted by base closures still often cried foul). In 1988, the BRAC Commission deemed the Philadelphia Naval Hospital “unsafe and inadequate to support modern health care” and recommended closure. The hospital employed about eight hundred personnel at that time and provided medical care for about 130,000 active-duty Navy personnel, retirees, and dependents in Southeastern Pennsylvania, New Jersey, and Delaware. By 1993, the government had vacated the property. The main hospital building was demolished in 2001; some of the other buildings were repurposed as housing and office space. In 1993 the government closed the Quartermaster’s textile factory (with its roots in the Schuylkill Arsenal) and moved the remaining part of the South Philadelphia operation to the Naval Support Station in Northeast Philadelphia, a facility later renamed the Defense Supply Center Philadelphia in 1998 and the Defense Logistics Agency Troop Support in 2010. In 2005, BRAC Commission recommendations led to merging the contiguous McGuire Air Force Base, Fort Dix, and the Lakehurst Naval Air Station (in Ocean County, New Jersey) into Joint Base McGuire-Dix-Lakehurst and shifting about one hundred personnel from Walter Reed Medical Center in Washington to Dover Air Force Base. The commission’s recommendations also closed the WWII-era Willow Grove Naval Air Station in 2011, with a loss of three thousand jobs. Attempts to recoup economic losses from base closures had varying degrees of success. The closure of the Philadelphia Naval Shipyard, for example, might have created a huge hole in the local economy, but in 2000 the government transferred one thousand acres to the Philadelphia Authority for Industrial Development for redevelopment as “The Navy Yard.” This mixed-use industrial, office, and research and development center appeared to be thriving as of 2016, when it was home to more than 11,500 employees and 145 companies occupying seven million square feet of real estate. In contrast, redevelopment at the Frankford Arsenal site stalled and the nearby community suffered because environmental problems impeded reuse for decades. As of 1993, only about six hundred were employed at the site. In 2014, however, delicatessen manufacturer Dietz & Watson broke ground on the still-underutilized site with plans to build a $50 million distribution center. The 200,000-square-foot building was expected to bring more than 150 new jobs to the region (in addition to the seven hundred employees expected to relocate from the company’s New Jersey facility). This still represented significantly fewer people employed at the former arsenal site than the World War II peak of about twenty-two thousand. Despite the loss of thousands of government jobs in the region as a result of government consolidations and attempts at cost-saving, the military maintained an active (if reduced) presence in the Philadelphia region into the twenty-first century. Active military installations within approximately fifty miles of Philadelphia as of 2016 included the Naval Support Activity-Philadelphia (at 700 Robbins Avenue, Philadelphia, with its Philadelphia Naval Yard Annex at 5001 S. Broad Street). A portion of the former site of Naval Air Station Joint Reserve Base Willow Grove remained in use as the Horsham Air Guard Station. The 111th Attack Wing (ATKW), one of three air wings of the Pennsylvania Air National Guard, in 2013 opened a control center for the MQ-9 remotely-piloted aircraft (or drones) there. The new command center brought about two hundred new military and civilian jobs to the base. 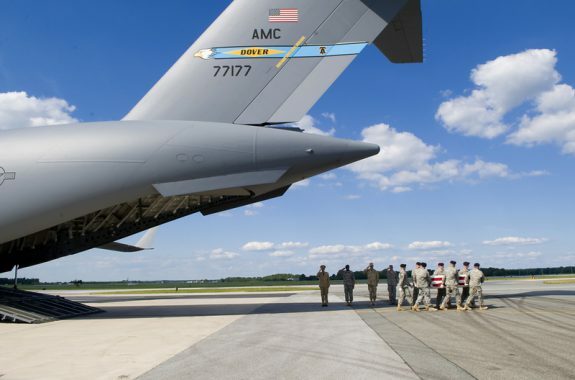 In Delaware, the Dover Air Force Base in 2016 was home to the Air Force’s 436th Airlift Wing, known as the “Eagle Wing” and the Air Force Reserve’s 512th Airlift Wing, known as the “Liberty Wing.” The base had become perhaps best known, however, as the site for the return of soldiers killed in action overseas. The base continued to employ more than 1,000 civilians, 350 officers, and 2,800 enlisted personnel. In New Jersey, the massive Joint Base McGuire-Dix-Lakehurst had more than forty-four thousand civilian employees, active duty personnel, and their family members living and working on and around the base and contributing to its economic impact on the region. From the Revolutionary War to the global war on terror and beyond, military bases and other facilities in Greater Philadelphia protected the homeland and trained, equipped, and otherwise served military personnel. Despite the loss of thousands of government jobs in Philadelphia and the surrounding region in the late twentieth and early twenty-first centuries, the military maintained an active presence that supported overseas contingency operations and contributed to local economies. Melissa Ziobro served as a command historian for the U.S. Army Communications-Electronics Command, Fort Monmouth, New Jersey, from 2004 until the base’s 2011 closure following recommendations by the BRAC Commission. She is the Specialist Professor of Public History at Monmouth University in West Long Branch, New Jersey. Ahern, Joseph James. Philadelphia Naval Shipyard. Charleston: Arcadia Publishing, 1997. Berens, Carol. Redeveloping Industrial Sites: A Guide for Architects, Planners, and Developers. Hoboken: John Wiley and Sons Inc., 2011. Boyd, G.W. McGuire Air Force Base. Charleston: Arcadia Press, 2003. Dorwart, Jeffrey. Fort Mifflin of Philadelphia: An Illustrated History. Philadelphia: The Barra Foundation, 1998. Farley, James. Making Arms in the Machine Age: Philadelphia’s Frankford Arsenal, 1816-1870. University Park: The University of Pennsylvania Press, 1994. Newell, Clayton R., and Charles R. Shrader. Of Duty Well and Faithfully Done: A History of the Regular Army in the Civil War. Lincoln: University of Nebraska Press, 2011. Miller, Frederic, et al. Philadelphia Stories: A Photographic History, 1920-1960. Philadelphia: Temple University Press, 1988. Waskie, Anthony Joseph. Philadelphia and the Civil War: Arsenal of the Union. Charleston: The History Press, 2011. Weigley, Russell, ed. Philadelphia: A 300-Year History. Philadelphia: The Barra Foundation, 1982. Williams, Peter John. Philadelphia: The World War I Years. Charleston: Arcadia Press, 2013. Brown, Jeff. “The Lessons of a Closed Arsenal: Frankford Arsenal had 22,000 Workers, as a Business Site it has 600.” Philadelphia Inquirer. 18 April 1993. Clairborne, William. “Frankford Arsenal Closing Despite Mondale’s Promise.” Washington Post. 19 March 1977. Landauer, Bill. “Horsham Air Guard Station to operate unmanned drones.” The Morning Call. 19 March 2013. Moran, Robert. 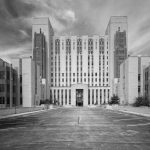 “Naval hospital evokes reflection: A soon-to-be-razed unit has a legacy.” Philadelphia Inquirer. 6 May 2001. Power, Edward, et al. “Massive Cuts Urged at Ft. Dix; Navy Base in Phila. is Spared.” Philadelphia Inquirer. 30 December 1988. U.S. Army unofficial records, include letters, speeches, lectures, journals, personal papers, manuscript, films, photographs, and artifact collections of U.S. Army personnel from all ranks, Army Heritage and Education Center (AHEC), 950 Soldiers Drive, Carlisle, Pa.
Federal military agency records for Delaware, Maryland, Pennsylvania, Virginia, and West Virginia, the National Archives at Philadelphia, 14700 Townsend Road, Philadelphia. Air Mobility Command Museum, Dover Air Force Base. 1301 Heritage Road, Dover Air Force Base, Del. Army Reserve Mobilization Museum, Fort Dix, N.J. The Delaware Valley Historical Aircraft Association Harold F. Pitcairn Wings of Freedom Aviation Museum, Route 611 between Maple Avenue and County Line Road, Horsham, Pa.
Navy Lakehurst Historical Society, Cathedral of the Air, 264 Hope Chapel Road, Lakehurst, N.J. The Navy Yard, 4747 S. Broad Street, Philadelphia. Pennsylvania Military Museum, 51 Boal Avenue, Boalsburg, Pa.
Pennsylvania National Guard Military Museum, Bldg. T-8-57, Fort Indiantown Gap, Annville, Pa.
Pennsylvania Veterans Museum, 12 East State Street, Media, Pa.